Hand crafted candles with floral designs at the La Source Parfumee in the village of Gourdon, Provence, France. Candles for sale (made on site) at La Source Parfumee, Old Distillery and Candle-making Workshop in the Village of Gourdon at 760 metres in the Alpes Maritimes, Provence, France, Europe. 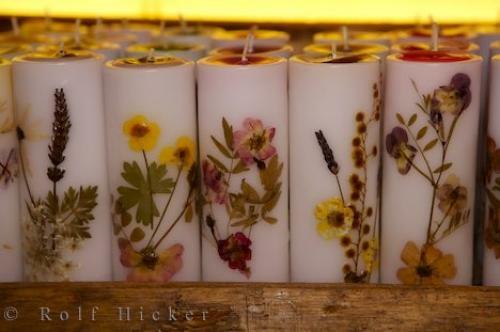 Photo of a selection of beautifully crafted floral candles at La Source Parfumee in Gourdon, Provence, France.